The Jersey Devil, a creature whose existence has been spoken for 500 years and counting, a creature often described as horse-headed, batlike wings, and cloven hooves, witnesses have claimed to have seen this creature amongst the desolate forests of Pine Barrens, New Jersey. 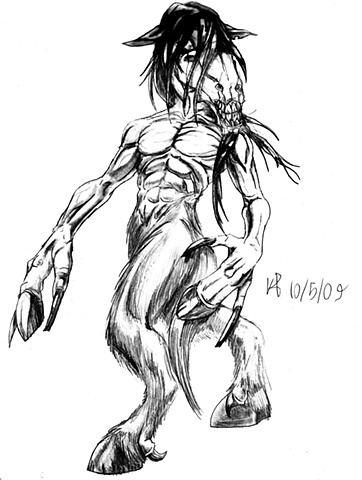 Its origins are as varied as the description of the creature itself, from shaman legends to the popular story of Mrs. Leeds (also its other name of the Leeds Devil) where Mrs. Leeds, mother of twelve children, proclaimed "If I give birth to another child, let it be the Devil itself" or something like that. Well, she got pregnant and delivered a normal baby, that turned into the monstrosity, killed the midwife and ran up the chimney and out into the woods. For my drawing of the Jersey Devil, I went for a deformed and bestial Jersey Devil, retaining the horse head and malforming the hands from an idea from Iguanodon, and making the hair mangy and thin. I also deformed its lips to have its teeth stand out and add to its creepy factor. I was thinking of adding the wings and horns, but I decided to keep the K.I.S.S. principle and keep it simple and effective.